I took the Yu Yu Hakusho personality test, so can you! 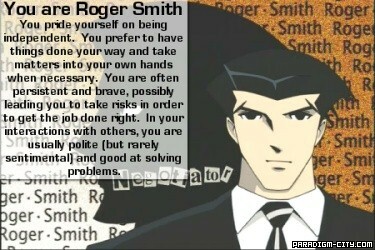 Which Big O character are you? Which Hellsing character are you? what's your cowboy bebop theme song? Which Psychotically Deranged Yugioh Guy Are You? - New And Improved With More Results! Which Famous Vampire are You? -Toko Miyashita- You are the real Boogiepop, aka, Angel of Death. heart of the Sabbat, Clan Tzimisce is the soul. face="Georgia" size="+1"> Now come and join your vampire community.